Jacqueline Wilson devotee that I am, I’ll say straight out that this falls some way short of the best of her recent offerings, having neither the Victorian allure of Sapphire Battersea, nor the affecting, contemporary peril of Lily Alone. The plot, which deals with little more than the inability of chalk and cheese sisters Melissa and narrator Marty to get along, is stretched pretty thinly. Their mother’s thriving new sewing business reveals itself all too soon as a device to pitch the warring siblings together in one bedroom; whilst the real point of the story – to prove that they actually love each other dearly – is arrived at all too late, and consequently feels rushed. 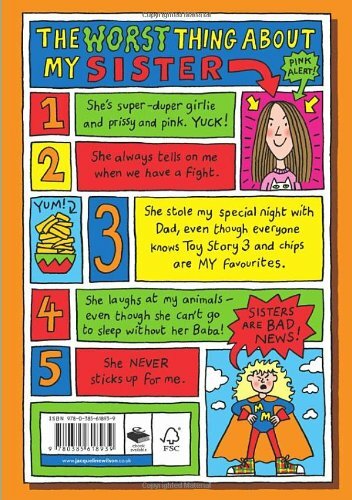 And why write such an inconsequential story about sisters anyway when you have already given your readers much more satisfying sibling tales in the shape of books like Double Act and My Sister Jodie? What The Worst Thing About My Sister does have in common with previous Wilson productions is a reassuring empathy, and a wraparound warmth, which ultimately make it impossible to dislike despite its shortcomings. Wilson is so consistently good at taking ordinary everyday matters and infusing them with all the life-and-death drama they exude when you are 9-years-old; in this case both the sartorial embarrassment of being forced to wear a frilly frock; and the horrid, creeping conviction that your parents love your sister more than they do you. There are some delightful and touching child’s-eye details here too: Percy the mangled teddy; transformed by Marty into a ‘pretty cool’ porcupine by the gluing of a hair brush onto his back for prickles (the only trouble being that it’s Melissa’s hair brush). And then there are the rest of Marty’s beloved toy pets; packed into a cardboard box for her room move with their heads sticking out. Why? So that they can breathe properly, of course.